Faraway Press: The Online Home of John Jackson Miller: Double the fun! Knight Errant #5 and Mass Effect Evolution #2 hit stands! Double the fun! 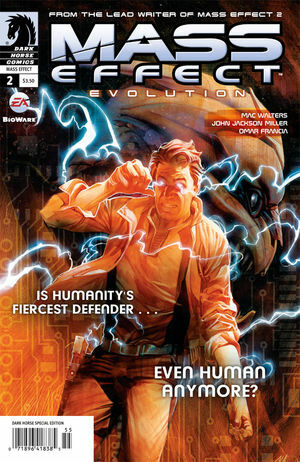 Knight Errant #5 and Mass Effect Evolution #2 hit stands! I'm sure this has happened to me at least once before, but it's a rarity -- I have two issues that go on sale today. First off, there's Star Wars: Knight Errant #5, the concluding issue of "Aflame." This is the missing piece, the last bit of story to come before the novel, already available. I'll have some notes on that issue available soon -- probably before I get to the notes for the novel. Second, there's Mass Effect: Evolution #2, which comes in two different covers, one by Joe Quinones and the other by Massimo Carnevale. Incredibly busy, but there's more to announce here in the next few days -- Lost Tribe of the Sith #6 goes online next week, and I have a signing at Westfield in Madison this Saturday -- complete with the 501st!